The greatest honour of my career thus far is being asked to speak at ICEM 2016 in Cape Town. 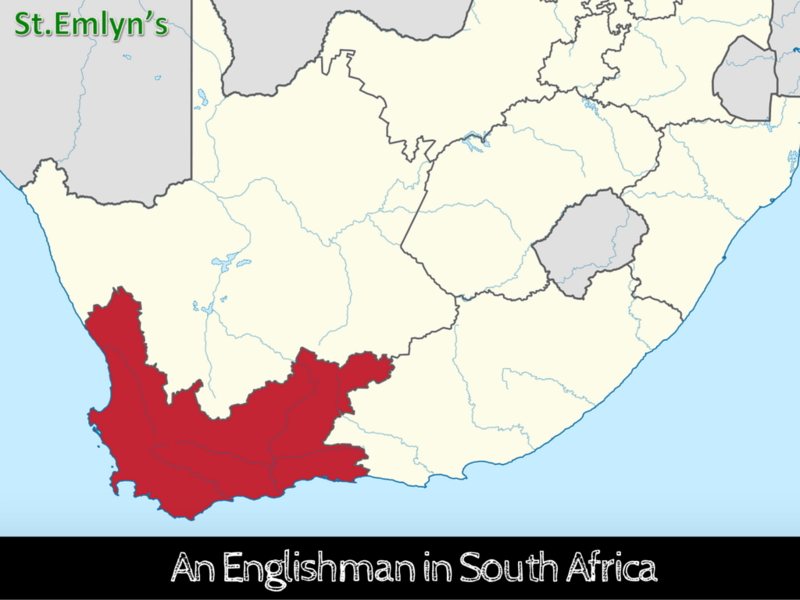 My talk was titled ‘A UK Trainee’s Lessons From the Western Cape’. This blog post compliments the podcast I did with Simon Carley which you can listen to on the link below. Last year, I was lucky enough to have a 3-month elective in South Africa. I split my time between New Somerset Hospital in Cape Town, and Khayelitsha District Hospital in the nearby township. It was the most educational experience of my career to date – here is my original blog on the experience. My most valuable lesson from the Western Cape? To perform well in an acutely stressful environment, you must have the right mindset. 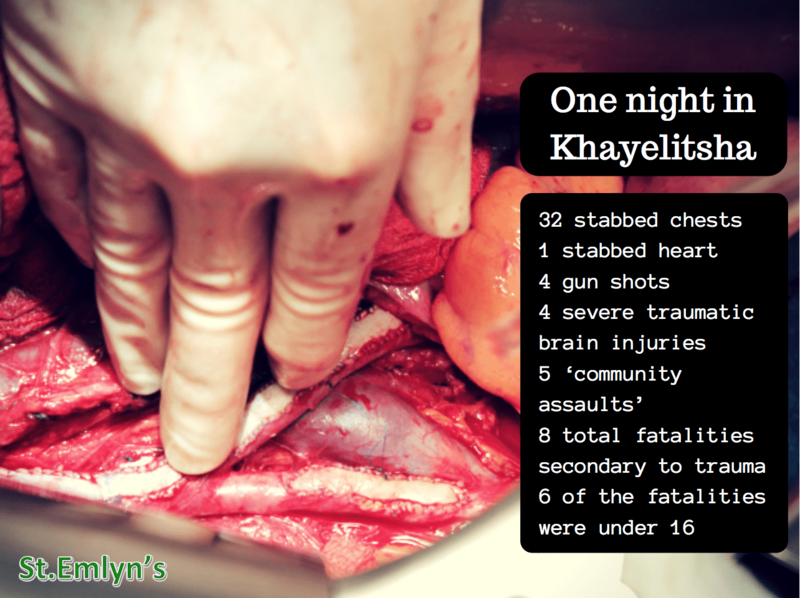 These are just the trauma statistics from my first night shift working in the staggeringly violent township of Khayelitsha– it honestly felt like working in a warzone. Throughout that first set of weekend nights, I was overwhelmed by the environment. I was completely unprepared for the onslaught of young major trauma patients – it was unimaginable. Having never been exposed to anything even remotely comparable, an intense physiological and emotional reaction ensued. This was devastating to my performance. The environment, and my reaction to it, was intense. Though I’m sure anyone who works in EM, regardless of setting, will be able to relate to that frighteningly visceral sensation of being completely out of your depth. On a daily basis in our specialty we must make decisions with massive implications on limited information, and perform time-critical interventions on rapidly deteriorating patients. We are an extreme specialty – the BASE jumpers of the medical community. In that first weekend in Khayelitsha, my mind and body let me down to such an extent that I was a useless member of the team, and a useless doctor to my patients. If our faculties are deemed sufficient to meet the demands of the scenario, we enter a ‘challenge’ mindset. Though still stressed, we have a positive, confidant outlook, setting us up for a success. When challenged, we are ‘in the zone’ and our performance improves. If we perceive our available resources to be insufficient (like I did), along comes the ‘threat’ mindset. When threatened, stress has a catastrophic effect on our ability to perform. We receive an enormous sympathetic surge (adrenaline/noradrenaline dump), and our HPA axis pumps out cortisol. High cortisol levels have a very detrimental effect on higher cognitive processes – decision-making and prioritisation suffered in my case. In the phenomenal book On Combat (listen here for an EMCrit book club podcast ), Dave Grossman brilliantly explains how the stress of combat affects the physiology and performance of soldiers and police officers – the warrior community . His colour-coded performance ‘conditions’ describe how well a soldier will perform in a given moment. 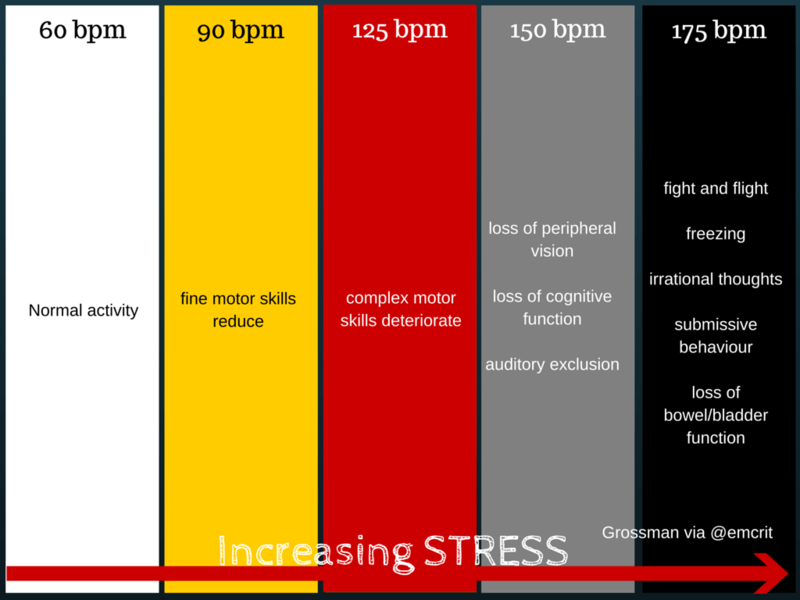 The conditions are determined by level of stress/arousal (heart rate is used as a surrogate for stress level). The ideal condition for warriors in combat is red – this level of stress activates the sympathetic nervous system just enough to optimise visual and cognitive reaction times, and gross motor skills are at their most effective – perfect for the battlefield. Fine motor skills start to deteriorate in red though, as the heart rate creeps up above 115. Medical practitioners should live in condition yellow. We need to be stressed enough to be alert and reactive, but not so stressed that we lose our complex motor skills. A steady hand is required to blunt dissect above the bottom rib to avoid the neurovascular bundle, or to carefully pull the laryngoscope back to bring the epiglottis into view. During my first few nightshifts working in Khayelitsha, there is no doubt that I was camped out in condition black. Multiple young casualties with devastating injuries requiring immediate life-saving interventions pushed me well beyond my optimal level of stress, and deep into the clutches of the ‘threat’ mindset. If I was to be of any use in South Africa, I knew that I needed to mentally prepare myself. I needed to make myself more resilient. A key difference between working in a South African ED and any of the other departments I’ve worked in (in UK/Australia) was that I could predict with certainty, particularly when working weekend nights, the type of pathology that I’d see. Alcohol-fuelled young males with precordial stab wounds were more frequent than confused elderly patients are in my current job. Lot’s of major trauma means lots of procedures – suturing, RSI, open intercostal drains etc. These procedures needed to be performed quickly and carefully; a needlestick injury would buy you a month of post-exposure prophylaxis as the HIV burden was enormous in the region. Whilst this burden of trauma was intimidating, it predictability allowed me to focus my preparations for the specific scenarios/procedures that I was guaranteed to encounter. It was a matter of ‘when’, not ‘if’. When the department got particularly busy, suturing instruments would run out. The South African doctors overcame this obstacle by using huge curved suture needles and manually driving the needle through the tissue and performing surgical hand ties to close wounds. With countless stab wounds and ‘panga’ (machete) injuries rolling in, I needed to learn how to hand-tie. They are also, of course, very useful for tying in intercostal drains. I had been taught whilst on surgical rotations in my Foundation training, but had largely forgotten the technique. So I went home with some spare suture needles and thread, and re-taught myself with the help of some excellent youtube vidoes. I would practice for hours until I had the technique nailed down. But I didn’t stop there. I kept practicing until I could do it with my eyes closed. I overlearnt the technique – it became automatic. This meant I didn’t need to waste any cognitive resources trying to remember how to do it on shift, and I felt confidant when I needed to perform under pressure. Another example of a skill that I overlearnt was EFAST scanning. I had received teaching on the topic in previous jobs, and so felt like I had a good grasp on the concept. However, I had only actually performed a handful of scans – all of them negative of course. With so much penetrating trauma in Khayelitsha and no CT scanner available, bedside ultrasound was a crucial investigation (there were two good scanners in resus). Desperate to be useful, I immersed myself in any online educational material I could find on EFAST. Whilst I was obviously unable to practice scanning at home, by overlearning the technique largely through FOAM resources, and familiarising myself over and over with the images, I felt ready to seize the ultrasound probe when the opportunity arose on shift. My confidence grew as time went on, and other members of my team began to trust my judgement when scanning patients in resus. I didn’t relent when I felt competent, I kept on hoovering up any education on the topic I could find – it made me feel ready to perform. I deliberately engaged in a process of mental rehearsal to ‘warm up’ for guaranteed clinical encounters. By playing a video in my mind of specific tasks, I felt more confidant and familiar with the processes when crunch-time really came. I repeatedly mentally rehearsed the steps of an RSI for example. Importantly, I rehearsed the procedure in the exact environment I would actually perform it. I imagined the sights, noises and smells of the busy department (the unforgettable scent of a blood and alcohol cocktail was a powerful tool). I visualised the process of gathering the equipment and drugs, setting everything up at the bedside, going through the pre-RSI checklist with my team, the feel of the laryngoscope in my hand, and then each step of the intubation in order. With more and more shifts under my belt, I could draw upon successful moments, and use them as a source of mental rehearsal material. I would replay the video of myself performing a calm, complication-free RSI in my head to get my confidence levels up for the next one. It wasn’t just for technical skills. I would also try and visualise stimuli that had previously drawn an intense emotionally-driven stress reaction from me. The scenario I used most often was the sight of multiple severely injured patients coming in simultaneously (crowds involved in the same skirmish often arrived together with their stabbed chests/necks/abdomens/panga-to-the-head). I tried to rehearse that disturbing visual, and reframe it with my emotions under control. Increasingly as I encountered that stressor, I was more able to react the way I had rehearsed it. We all intuitively mentally rehearse, but usually on a subconscious level. It was my desperation to improve on my initially dismal performance, along with the luxury of knowing when the next high octane moment would be (the next shift), that led me to the realisation that conscious, deliberate mental rehearsal made me infinitely more prepared to climb the mountain in front of me. 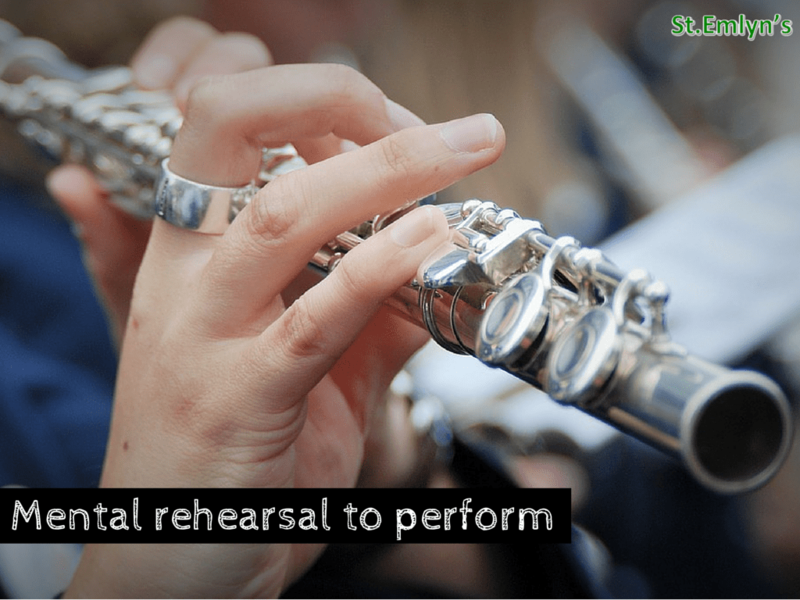 – Mental Rehearsal worked for me… Any evidence? It’s widely practiced by elite athletes and performance artists, and there is now a body of evidence demonstrating its value in surgery for improving performance and reducing procedural error. In 2015, Rao et al published a systematic review of the role of mental rehearsal in surgical training . 9 RCTs were identified, and 5 of them showed a positive effect on performance. Positive trials introduced structured mental rehearsal by way of reading a script with imagery cues, and the sessions lasted 30-90 minutes prior to an actual/simulated surgical scenario. Negative studies had short, unsupervised and unscripted mental rehearsal sessions. There is also some emerging evidence in the non-technical skills literature. Last year, Lorello et al compared structured mental rehearsal with traditional ATLS teaching prior to a trauma resuscitation team simulation, and demonstrated a better performance in the mental rehearsal group . I believe this will become part of our EM curriculum in the near future – it’s quick, cheap and flexible. It certainly did a job for me out in the Western Cape. I never realised my dream of winning Wimbledon, but I was a very keen junior tennis player in a previous life. 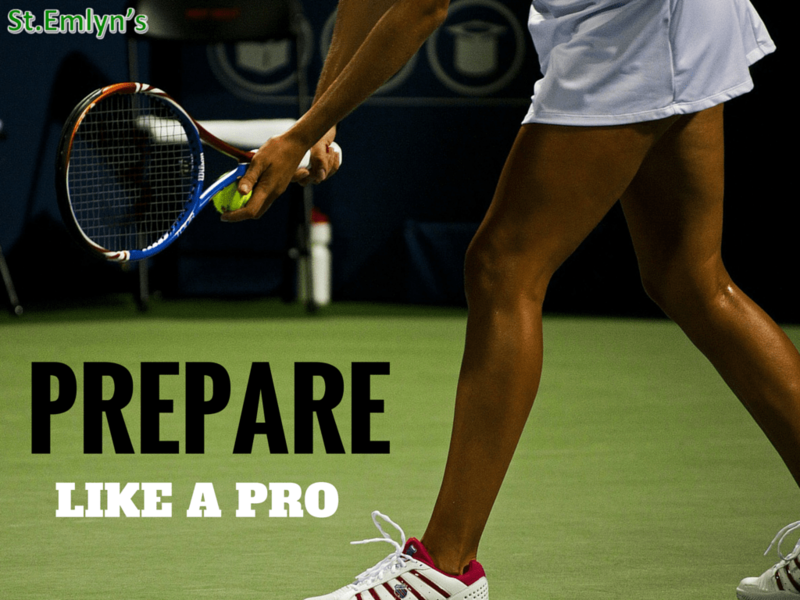 Tennis meant a lot to me as a kid – I practiced every day and prepared for every match ‘like a pro’. I applied the same attitude going to work in South Africa. I prepared for work ‘like a pro’. I would get a good nights sleep, eat a healthy breakfast, have a well timed coffee, wear freshly ironed scrubs, and listen to uplifting music to get myself in the zone. Going the extra mile in this domain made me feel ready for battle. I was pumped for every single shift. I knew in my heart I was giving my body and mind the best possible chance of success in the pressure-cooker I was entering – and it paid off. In those first few shifts where I encountered that ferocious stress reaction, I remember my mind becoming polluted with negative, persecutory thoughts. Clearly if my own my mind was saying things like that to me, I had no chance of delivering a performance. I had barely walked into the resus room and I was a beaten man. I remember when I was competing on the tennis court with my back against the wall, I would deliberately engage in positive self-talk. By utilising a similar pattern of positive-self talk as a way of fending off a negative spiral, I was able to settle myself down and get myself into the challenge mindset at work. It prompted me to re-set if my mindset was deteriorating, and was particularly useful just prior to or during a procedure. I was re-framing my own narrative, and setting myself up for a win. Along with mental rehearsal, positive self-talk is a mainstay of practice for the elite sports community, where it has been proven to improve sporting performance . If it’s good enough for people that play games in front of large crowds, it should be good enough for people who save lives for a living! Intuitively I would slow my breathing down during a ramped up moment where I felt particularly ‘threatened’ (e.g. when multiple casualties arrived at once). The slower I deliberately made myself breathe the more in control I felt. My heart would stop pounding my chest wall, the ringing in my ears would quieten down, and my mind would become less crowded. Much like the other things I’ve discussed in this post, I’m sure we all use this technique to varying degrees subconsciously. It was the regularity of such intense stimulus in the township hospital that made me realise how helpful it was to slow my breathing, and so it became part of my routine just before a big resus was about to go down. I had no idea that I’d stumbled across a technique widely practiced by those who operate in the most hostile environments on the planet – the military. 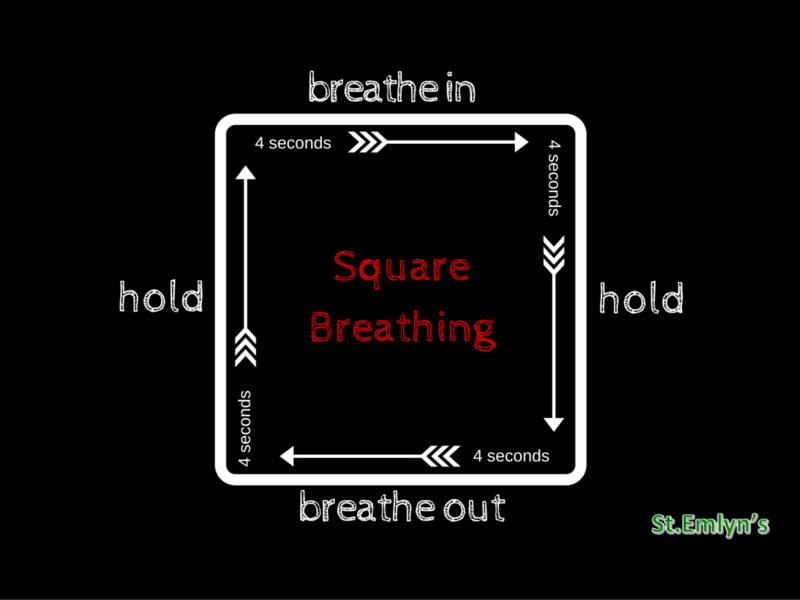 In On Combat, Grossman outlines the ‘tactical breathing’ (also known as ‘square breathing’) he teaches warriors so they can regulate their arousal and stay cognitively present in a high stakes moment . Breathing is the only autonomic process that we can consciously control (other than blinking – less useful). By doing so, we access the ‘steering wheel’ of our sympathetic nervous system, and can regain a feeling of self-control in a moment of extreme stress. Heart rate and blood pressure come down, and all of the catastrophic features of condition black drift away. Seppala et al conducted a small RCT in 2014 that demonstrated introduction of another breathing technique – Sudarshan Kriya Yoga – resulted in reduced stress response and anxiety symptoms in US army veterans with severe PTSD . Sudarshan yoga is a different method to tactical breathing, suggesting that it’s not the precise technique employed that matters, it is merely the process of deliberately controlling ones breath in the midst of a stressful moment that is key. A Resus Warrior by the end? Certainly not! I cannot claim to have become a master in the art of performing under pressure. I wasn’t able to acquire the bulletproof mindset that seemingly every South African doctor I worked with had. However by the end of my three months out there, I was unrecognisable from the frightened creature that had a meltdown during those first few night shifts. I felt like a confidant, useful member of the team, and I provided a service to the patients. I’m immensely proud that I survived out there, with my identity as a good emergency medicine trainee fully intact. By using the tools I have described I built myself a more resilient mindset. In doing so, I had the most educational and rewarding experience of my career. And I’m hungry for more. Not everybody can be as lucky as me and have the opportunity to work in a South African township and reap the benefits of repeated extreme stress exposure. Can the same benefits be acquired through training? I’ve recently become aware of a training technique called stress inoculation training (SIT), which has been championed by the military [3, 8-10]. It converts a ‘threat’ to a ‘challenge’ mindset by building resilience to a controlled stressful stimulus. It arms you with prophylaxis against condition black. Conceptualisation: Individual is educated, improving understanding of the human stress response. Skill acquisition/rehearsal: Coping strategies for acute stress are taught and developed. Inoculation: Controlled, graded exposure to a stressful stimulus. I believe that I went through a stress inoculation process in South Africa – although of course it was not training, it was real life with real patients. Through my unanticipated ‘Baptism of Fire’ I educated myself about the realities of acute, extreme stress. I then armed myself with coping tools, and re-immersed myself in the environment over and over. I became acclimitised to the stressful environment, and my performance improved. Excitingly, SIT is making its way into medical training. It has been discussed at length by FOAM visionaries such as Scott Weingart, Cliff Reid and Michael Lauria [2, 10, 11]. There was also a SIT workshop at SMACC Chicago last year . I believe we can modify simulation training to incorporate the components of SIT. All too often in my own experience, the focus of the sim debrief has been on technical skills (e.g. difficult airway) or medical management (e.g. ALS algorithm). There is always some attention given to CRM principles such as communication, leadership and situational awareness, but I have never heard acute stress management given much airtime. I reiterate though, this is just my own experience. Sim is inherently stressful as you are performing in front of colleagues and an assessor. Phases 1 and 2 of SIT would fit nicely into a pre-scenario workshop during a day in the sim lab. Phase 3 would then be the sim scenario itself, and the stress levels could be deliberately ramped up to test out the coping strategies that will have been introduced earlier in the day. 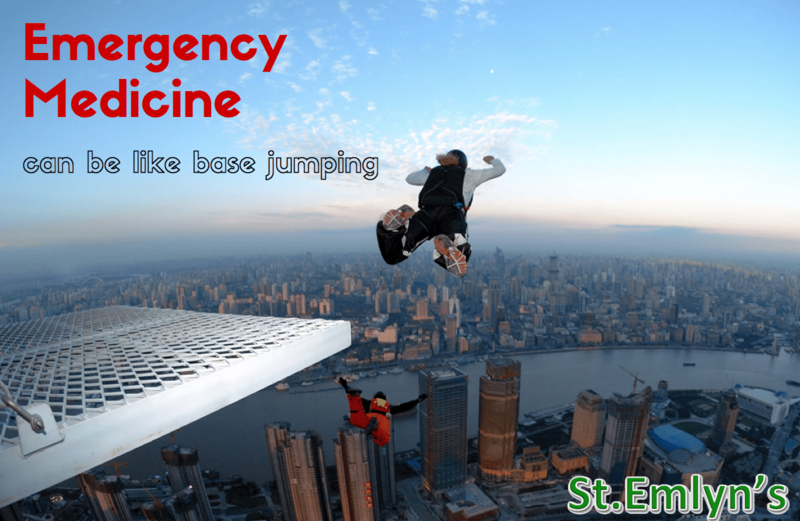 It doesn’t matter what setting, every shift in the ED is a potential BASE jump. Perhaps that’s what we should be training for. LeBlanc, V.R., The effects of acute stress on performance: implications for health professions education. Acad Med, 2009. 84(10 Suppl): p. S25-33. Scott Weingart, C.R., Podcast 118 – Emcrit Book Club – On Combat by Dave Grossman, in EMCrit Podcast. 2014. Grossman, L.C.D., On Combat: The Psychology and Physiology of Deadly Conflict in War and in Peace. 2008: Warrior Science Publications. Rao, A., I. Tait, and A. Alijani, Systematic review and meta-analysis of the role of mental training in the acquisition of technical skills in surgery. Am J Surg, 2015. 210(3): p. 545-53. Lorello, G.R., et al., Mental practice: a simple tool to enhance team-based trauma resuscitation. CJEM, 2016. 18(2): p. 136-42. Tod, D., J. Hardy, and E. Oliver, Effects of self-talk: a systematic review. J Sport Exerc Psychol, 2011. 33(5): p. 666-87. Seppala, E.M., et al., Breathing-based meditation decreases posttraumatic stress disorder symptoms in U.S. military veterans: a randomized controlled longitudinal study. J Trauma Stress, 2014. 27(4): p. 397-405. Grossman, L.C.D., Bulletproof Mind: How the Body Responds to Combat. 2011. Asken, M.J., Warrior Mindset. 2010: Warrior Science Publications. Lauria, M., Stress Inoculation Training. 2015: Emcrit.org. Weingart, S., Podcast 132 – MoTR – Toughness Part 1 with Michael Lauria, in EMCrit Podcast. 2014. SMACC. Learning to Take the Heat Workshop. 2015; Available from: http://lifeinthefastlane.com/learning-to-take-the-heat-at-smaccus/. Loved your article – you captured so eloquently and rather scientifically- what we doctors do naturally working in a place like Khayelitsha. We just aren’t always aware of our mental training, or at good at writing it down. Well done for getting through – better yet, for adapting and thriving in that situation! A brilliant post, thank you for putting this together. Warmed my heart as I assembled the instructional material for our first simulation-based EM stress inoculation session, cued up for tomorrow (with Co-PI Vicki LeBlanc). If you’re ever interested in hearing more or collaborating further, let me know — great to have as many minds working on this stuff as possible. I would also be keen to hear more about how you put these skills into practice in SA.